WWI Profile: Kendrick Whiteleaf Outlaw 1892-1918 | Friends of Fort Caswell Rifle Range, Inc.
His WWI Draft Registration shows he was living in Winnabow, single, and working on a farm. 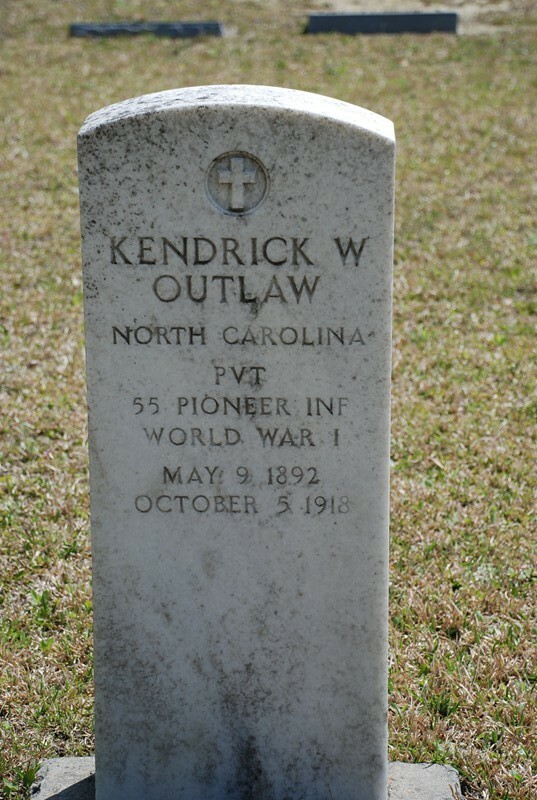 Kendrick was ordered to report for duty on August 8, 1918. 25 men were called to report that day in Brunswick County and sent to Camp Wadsworth, SC. 11 of them, including Kendrick, were eventually assigned to the 55th Pioneer Infantry. [Source: Ancestry] Elijah Milliken, who was born in Southport, NC, but currently lived in Rocky Mount, is included in the WWI Brunswick County list, to make a total of 12 Brunswick County men serving with the 55th Pioneer Infantry. Camp Wadsworth, SC, was established in 1917 and abandoned in 1919. Note: The companies listed do not necessarily match NC WWI Service Cards. Not all have companies identified, so the companies were found through the US Army Transportation records located in Ancestry. Therefore, the companies listed are the ones the soldiers sailed with overseas, giving us insight into their experiences. Pvt Outlaw’s NC WWI Service Card has no beginning date for overseas service. However, the US Army Transport Passenger List shows Pvt Outlaw and the soldiers above sailing on September 15, 1918. Paging through the very long passenger lists for Pvt Outlaw, the first few pages show that USS Aeolus sailed from Newport News, VA, on September 15, 1918, to France, with over 3500 passengers. There is no arrival date found. When the United States entered the war on April 6, 1917, German ships in US ports were seized. The USS Aeolus was formerly SS Grosser Kurfürst. The German crews were sent to internment camps, but not before they sabotaged the ship. 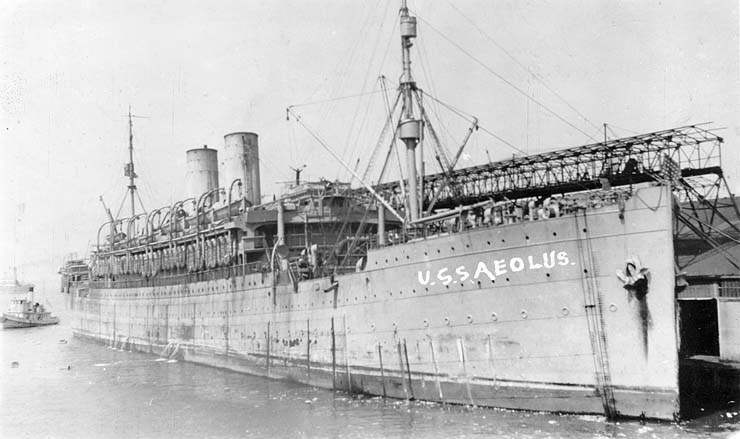 She was repaired and renamed USS Aeolus, god of wind in Greek mythology, making eight round-trip voyages to France during World War I, and seven post-war voyages returning troops. 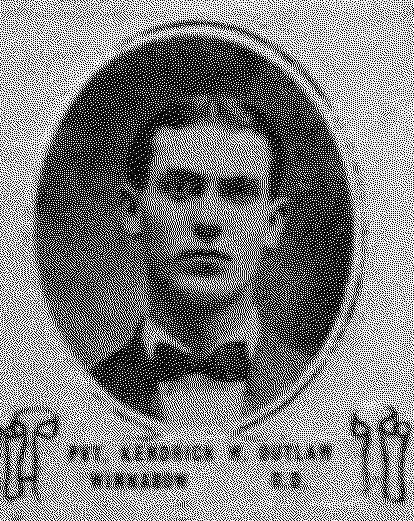 Pvt Outlaw passed away from lobar pneumonia on October 5, 1918, soon after arriving in France. The location of his death is unknown. Around this same time, General Pershing’s Chief-of-Staff wired that “a great number of cases of severe influenza and pneumonia and consequently many deaths among troops recently arriving in France.” Back home, Southport and Brunswick County were struggling with the pandemic, as described in Robert Guy Farmer’s WWI Profile, yet another Brunswick County soldier who died of pneumonia in October 1918. Pvt Outlaw’s remains were returned on June 29, 1920 on USAT Mercury and laid to rest in Lebanon Baptist Church Cemetery in Winnabow, NC, where his mother and later his father were buried. A military headstone was requested in 1950 [Source: Military headstone application in Ancestry] by his sister Flossie Outlaw Willets, and placed in the cemetery.